When talking about time or durations introduced by in - in two hours, in 1876,... - in French you will either use dans or en. Nous avons mangé en 40 minutes. We ate in forty minutes. Ils ont fini ce marathon en quatre heures quarante minutes. They finished that marathon in four hours and forty minutes. Léonard de Vinci a peint la Joconde en quatre ans. Leonardo Da Vinci painted the Mona Lisa in four years. En expresses the length of time something takes to be done. Je serai là dans deux semaines. I will be there in two weeks. Votre colis sera livré dans cinq jours ouvrés. Your package will be delivered in 5 working days. Dans indicates the time until something will happen. En 1815, Napoléon fut vaincu. In 1815, Napoleon was defeated. En quelle année vous êtes-vous rencontrés? In what year did you meet? Mon fils est né en septembre. My son was born in September. Il part toujours en vacances en juillet. He always goes on holiday [US: vacation] in July. En is used with years and months. Il est né en 1765. He was born in 1765. In the example Je serais là dans deux semaines. Would it also be correct to say J’y serais dans deux semaines. So can dans be replaced with apres to mean the same thing here?
" Nous mangerons dans une heure/apres une heure. " 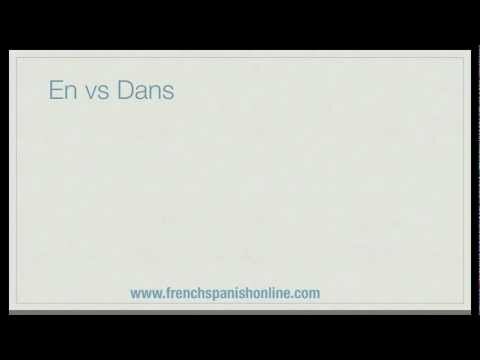 If so, saying this would make the lesson easier to grasp, because dans and en mean practically the same thing when en means in in my head. Dépêche-toi, on va manger dans 5 minutes. -- Hurry up, we are going to eat in 5 minutes. This sentence wouldn't really work with après, just as in English you wouldn't really say, "we'll eat after 5 minutes." You are right that dans and en come close in meaning but they aren't really interchangable. Dans means the time is still taken to do a task ? I don't understand what you mean by that. Did my reply to your previous post answer your question? En means the total duration of time has been taken to do a task. Hi Shruti, yes, you are right. Boivez un verre d'eau en 5 minutes. -- Drink a glass of water within 5 minutes. Boivez un verre d'eau dans 5 minutes. -- Drink a glass of water in 5 minutes. Can "en" ever express waiting? I understand the examples given in this lecture (although I'd have like "en" to be contrasted with "pendant" as well), but can "en" ever mean "in" as in "I'll leave in one hour"? Or should I forget completely about using "en" in that sense? I'll leave in one hour is "Je pars dans une heure." I believe that "en" cannot be used in this context. "Je pars en une heure" would mean I leave within one hour. -- Chris (not a native speaker). Yes, that makes sense. Thank you. Bonjour Tom and Chris ! Actually, "Je pars en une heure" would be closer to something like "It's taking me an hour to leave. ", in a very awkward way. How do you say "within an hour"? "Dinner will be served within an hour" was the wrong choice on the test for "le dîner sera servi dans une heure". If I wanted to be less precise than "in an hour's time", how would I express that? Bonjour Sherry ! To say "Dinner will be served within an hour" you would have to say "Le dîner sera servi *en* moins d'une heure" (literally: within less than an hour / comprised in one hour) or "Le dîner sera servi *dans* moins d'une heure" (literally: in less than an hour's time). I hope that's helpful! À bientôt ! I'm a bit confused about the possibility for "en" in this context. Does that mean that "en" can express future actions as well? How about "in the evening" or "in the morning" as a one-time event? I understand that if one does something every evening the term is "le soir" (Tu ne lis que le soir). But what if I'm referring to a specific evening, for example: On est partis tôt et on est arrivés à la maison (in the evening). While I'm asking, how would one modify that to express "early in the evening." Bonjour Charles ! 1- To say "We come home in the evening (specific day)", you would use "dans la soirée" in the sense of "at one point in the duration of that evening", OR "le soir-même" to emphasise "that very evening": - Nous sommes arrivés dans la soirée/matinée. - Nous sommes arrivés le soir-même / le matin-même. 2. To add "early/late in the evening", you will only use " dans la soirée", as such: - Nous sommes arrivés tôt dans la soirée. I hope that's helpful! I think the British and American English are a bit different, so I'm still not quite clear on this. So does "Nous avons mangé en 40 minutes" means we ate for 40 minutes? The duration of our meal was 40 minutes? It took us 40 minutes to eat? And "Nous mangerons dans une heure" means we will have to wait for another hour before we can eat, right? I think it's the same in US and UK English: Nous avons mangé en 40 minutes = "Over the course of 40 minutes, we ate." All of the sentences you wrote mean the same thing as this. Nous mangerons dans une heure = yes, we will eat in an hour from now.